It’s unseasonably cold in Minnesota right now. We’re talking snow, and single digit low temps overnight. It’s exactly the sort of weather that makes me want to throw in a Christmas movie, roll up my sleeves, and bake a million cookies. Except I can’t. I just can’t. I have a very strong belief that we can’t ignore Thanksgiving. Yes, the biggest, most commercialized shopping day of the year follows directly afterward, or at some stores, that very evening (which I think is awful), but still. We have to focus on gratitude. I think we’re incredibly lucky to have a nondenominational holiday focused on giving thanks for what we have with family, friends, and food. Gratitude is something I’m personally trying to focus on more, so I’m throwing all my festive holiday spirit into Thanksgiving. Right now, stuffed squash is having a hot moment in my heart. This rosemary-spiced stuffing perfect with sweet, buttery acorn squash. And while I’ve always been a bit intimidated by roasting and stuffing squash, it’s really quite simple. The hardest part is probably cutting the dang thing in half, which took me several attempts, and a few concerned looks from my boyfriend, but resulted in zero severed limbs, and lots of delicious food. This would be a great as a side dish (without the protein added) or a lighter main course to counteract all the stuffing-of-the-face that will happy in two weeks. 1. Prep your squash for roasting: Preheat the oven to 375°F with a rack in the lower-middle position. Slice the squash in half from stem to root and scoop out the seeds. Place the squash halves cut-side-down in a baking dish and pour in enough hot water to fill the pan by about 1/4 inch. Cover the dish loosely with foil and place the dish in the oven. 2. Roast the squash: Roast the squash until very soft and tender when poked with a fork or paring knife, 30 to 50 minutes. Exact roasting time will depend on the size of your squash, mine went for about 40 minutes. 3. Prepare the filling. While the squash cooks, make your quinoa according to the instructions on the package. You’ll need about 1 1/2 cups total depending on the size of your squash. Chop the celery, carrots, and green pepper, and stir into the quinoa. Cook your sausage (if uncooked) or chop and add to the quinoa mixture. Add your salt, pepper, and rosemary, and stir until thoroughly combined. 4. Stuff the squash halves: Once your squash is cooked, carefully flip the halves so they form bowls. Divide the filling between the halves — it’s fine to really stuff the wells and also to mound the filling on top. 5. 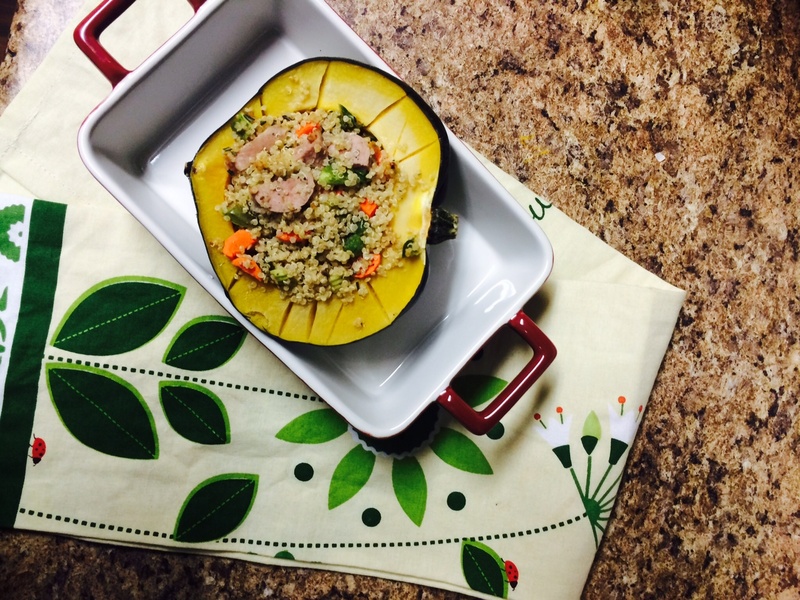 Put the stuffed squash back in the oven, and bake until the quinoa is lightly golden brown, about 15-20 minutes. This entry was posted in Uncategorized and tagged acorn sqaush, roasted acorn squash, side dishes, stuffed squash, Thanksgiving by theculinarycapers. Bookmark the permalink.